Hello Shoe Lovers! Spring is coming upon us and many ladies out there is planning a wedding right now. I know when I got married and was in the planning stages my wedding shoes were very important to me. Do you want to be comfortable through out the day or do you choose fashion? I know that I went with fashion and ended up holding my Badgely Mischka shoes but I loved them. Here is a look at my shoes, I want to share them with you and of course any excuse to go through my wedding pictures! For this week’s Tuesday Shoesday I thought we could take a look at some gorgeous shoes that I think would be a great choice for any of you brides out there. I know there are a lot of things to consider in picking out wedding shoes. Where is your wedding? Do you want a colored shoe or do you want to stick with white? How high of a heel do you think you can handle all day? Can you dance in them? I love the SJP Collection Etta Style. The pink reminds me of my wedding shoes but they have a closed toe. I have tried them on and they are wearable and I think I could wear them for many hours without complaint. How gorgeous are these SJP Shoes?? If you want to stick to a neutral color what about these satin Kate Spade Clarice Pumps? This what I think of when I picture a traditional wedding shoe. I love the detail at the toe and the heel height does not seem to high for dancing and the leather soles will keep you from slipping on the dance floor! If you are looking for a flat shoe, how fabulous are these wedding ballet flats by Cheers? It is also a perfect choice if you are looking for something blue to check off your list. I could not do a wedding shoe post without showing off some Manolo Blahnik wedding shoes. These are the Manolo Blahnik Swan White Satin Pumps. This shoe is also famous for being featured in Twilight Breaking Dawn. I just love the intricate crystal embellishment on the toe! If you are getting married on a beach, what about choosing some flat sandals for your wedding shoes? You can still get something gorgeous and still splurge worthy. These are the Jimmy Choo Nox Flat Crystal Thongs. The thongs are embellished and also feature leather soles. With these wedding shoes you will also be able to wear them over and over again. I love these sandals because of their versatility, who doesn’t need a dressy flat sandal for vacations etc. I had to of course add my own wedding shoes. This is a Badgley Mischka classic wedding shoe. The Randall by Badgley Mischka comes in vanilla, sky blue and a blush pink. 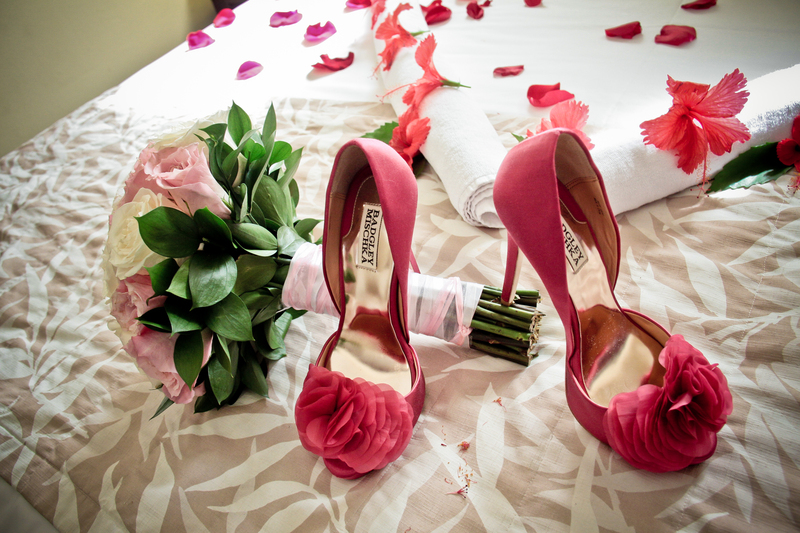 When I had bought my wedding shoes I bought them in a rose color. I could not find that color online right now. I loved these shoes but they are a little high. I made it through the ceremony but did not get to dance in them! I do not regret my choice, I loved these shoes! What shoes did you choose as your wedding shoes? Which ones are your favorite? I know so many people in my life that could use all three of these steps. If you look at successful people they usually follow these life rules. Go after what you want, ask for what you want and step forward. In order to step forward you need to stop focusing on past failures. This last step is so important. We are all guilty of at one time being stuck in the same spot out of fear of failure or repeating past mistakes. If we do not step forward we can never progress. When I was young I grew up in a negative environment and was not taught these life lessons. For those of you that are parents look at these rules and see how you can teach them to your children. I wish that someone had told me how to succeed and how to be a more positive person. I will be having my first child this month and raising them to be positive and to possess self-confidence has been weighing heavily on my mind. I had always worried that since that was not instilled in me at a young age would I be able to teach this to my kids. What I keep telling myself is that knowledge is power. Since I have taught these things to myself I will make sure these are really important life lessons that I can give to me child. Whether you are working on a fitness, health, love, relationship, work and just life goals you can apply this motivational quote to those goals. 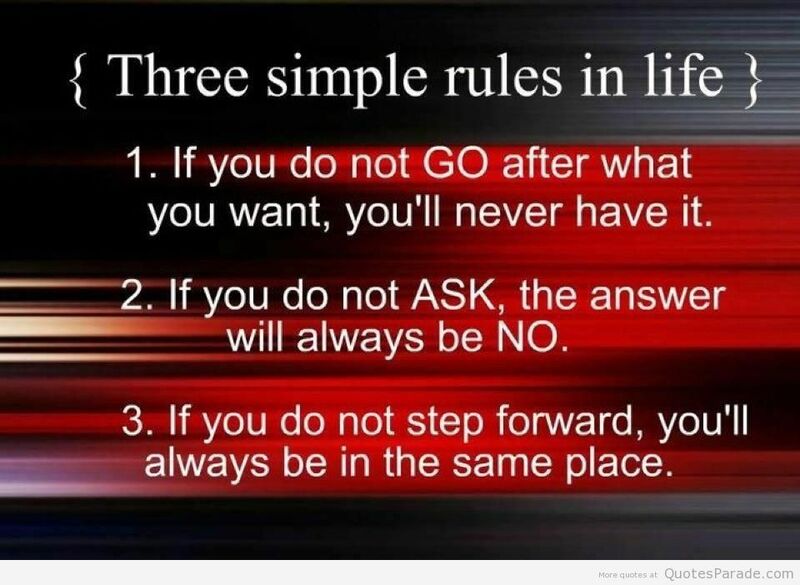 I hope as you move forward this week that you will keep these three rules in mind. As always, live with a positive attitude and you will get so much farther. What are some of the goals that you are working towards right now? Happy Sunday! Like we always do on Sundays me and Jon have been fairly lazy we usually go out for lunch and then laze around until it is time to cook Sunday Supper. I will admit during the weekend I indulge in what I consider to be forbidden foods more than I do during the week. During the week we eat health and cook healthy, for a couple in NYC that is an oddity. Most people here never ever use their kitchen but if you were to visit our kitchen you would see that it is well used and loved. I hope a lot of you are cooking today and cooking something delicious yet healthy. What will you be having for Sunday Supper? Hey fashion lovers! I was on one of my favorite twitter chats #BeautyTalk on a Tuesday night and we had been talking about beauty as usual and I had brought up that happiness can be a beauty tip. I firmly believe in this. I think I have never felt more beautiful since I have been the happiest I have ever been. Living a positive life can be one of the best fashion or beauty tips that anyone can follow. A happy person radiates confidence and always seems more vibrant. Let’s all try to the best and happiest you that you can be! I have posted this a few times and usually get a good response from people who are genuinely trying to build up there blogs. I also receive a lot of messages from companies trying to disguise as writer’s interested in blogging in order to get free advertising. The thing as most of your bloggers know, blogging is hard work and a time-consuming job. It is very disconcerting when I receive so many messages from very large companies trying to get ad space for free. I need to make a living to folks! For those of you looking for advertorial and sponsored posts I do them as well. Up at the top of the page there is a page link for sponsors/ads. I have worked with quite a few companies now so feel free to contact me through that page and I would love to talk about rates and opportunities. For those of you that have done guest blogging for me in the past and have enjoyed your experience please reach out and I would be happy to work with you again. I also am open to doing a guest blogging exchange where I can write a post for you in exchange for a post for nycfitfoodfashion.com. This way we both can gain traffic from each other and both of our readership will get to be introduced to a new blog that they may not have been aware of before. It is a win for the both of us! Start brainstorming and email me with some of your ideas. The other great thing about guest blogs is that I am able to get a different view or opinion out to my readers here or maybe even some topics that I had not even thought about yet. I would love to hear what kind of topics that you may come up with. For this next period I am looking for posts to be submitted with a deadline by March 20th at the latest. That way I can post them and have a date for you in which they will go live before I am incommunicado for a few days with the baby! If you are interested in guest blogging please send me an email over at nycfitfoodfashion@gmail.com. I look forward to hearing and hopefully working with you! Happy Weekend everyone! It was finally a warm day here in NYC. Spring is definitely on its way! With the nice weather we spent some time walking today and even took the dog out for a long stroll. I also did not hit the gym and did indulge in some treats. I can not say no to mini eggs when offered, I blame that on Jon! 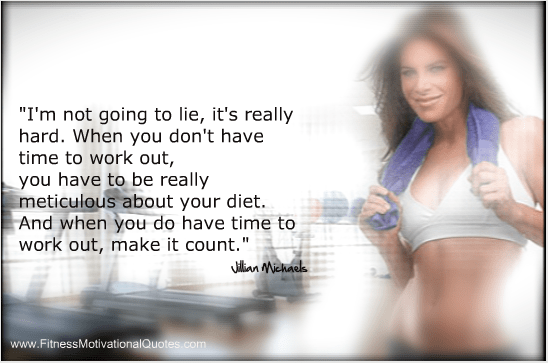 Jillian Michaels has always been an inspiration to me. When looking for a new quote to post this week I immediately thought of her. I found this one and find it to be so true. 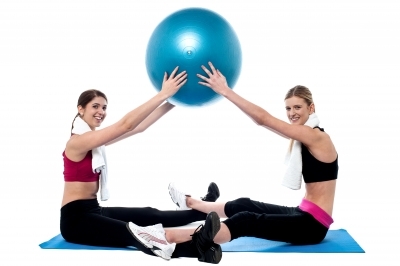 I have posted many times about how important diet is, even more important than exercise. We all deserve a treat once in a while but when you do not have the time to work out for a bit because we all know life can get in the way, make sure to eat well. Have a great weekend! March Catalog – Free People’s March catalog stars a model who defines effortless cool, Erin Wasson. The collection sheds its winter layers and embraces a bare look for spring. The collection features an eclectic mix of pieces from ‘barely there’ tops layered with strappy bras, to bold South American-inspired denim, and breezy maxis. Accessories focus on long drapey chains and statement arm cuffs to complete the look. Shop the Catalog here. Short Film ‘The Ride’ – The catalog follows Erin and her (fictional) beau as they took a (real-life) road trip through the vast Midwestern desert on a classic Harley Davidson. The pair made stops at motels and diners, all the while being captured for the campaign along the way. When the adventurous duo reached their destination ? the Little White Wedding Chapel in Las Vegas ? Erin posed as a blushing bride saying her ‘I do’s’ to her denim-clad groom. Watch the Short Film here. ‘Open Call’ Talent Scout Competition – Free People, is teaming up with Jed Root, a global leader in artist management, and IMG Models, a top international model management agency, to launch ‘Open Call,’ a hunt to find creative talent from across the country. Together, they will scout individuals who are passionate about styling, modeling, and photography to produce and appear in Free People’s upcoming e-Catalog launching in June. Each winner will have a once in a lifetime chance to work alongside famed model, Erin Wasson, and a talented team of creative professionals. See Website for the details. Hey guys! We are so close to spring I can almost feel it. I know it is still cold out but a girl can dream right. It is time to start putting together our spring wardrobe. I know I am not the only one that needs some new spring dresses to add into the mix of spring looks that I already own. Recently I have been introduced to the beautiful dresses from the awesome people over at Review. I could not believe how many styles of Review Evening Dresses that were available. Review is designed in Australia and take inspiration from many different locals including London, New York and Paris. A lot of the dress styles have a romantic vintage feel to them that I love. Review has been around for 25 years and I am just finding them now?? Their site is definitely a place to check out some gorgeous dresses. They also have an amazing selection of special occasion and bridesmaid dresses. If you are looking for bridesmaids dresses with a romantic feel this site has all that and more. Here are a couple of style I have fallen in love with. As you can see just from my choices that Review has a spectacular selection of dresses. There are so many different styles, textures and colors of review evening dresses to choose from. I really love the yellow dress above and it would go perfect with my new Jade colored heels that I bought last week! The only problem that you may face is picking out just one. When looking at all of the dresses I found that there were so many occasions that I would be able to wear these dresses this spring. I can picture the floral ones dressed up or down, if you wanted to go casual what about pairing one of these dresses with a leather flat sandal and a tote bag. Review also has a great selection of accessories to choose from as well. I found this fantastic bag that would go perfectly with any of the dresses that you may find during your online shopping. When it comes to online shopping I am a whiz at it. I know I have expressed this many times on my blog but I prefer shopping online to going into the stores here in NYC. No lines, no hassles and I know the merchandise is going to be up to par. I also enjoy sitting here in my pjs drinking my coffee and going through all the spring dresses without ever leaving the comfort of my living room. So what are you waiting for? It is time to up your spring dress game! I shared with you my favorites, what are yours? This is a sponsored post, views and opinions are my own and have not been affected in any way. I would like to thank Review Australia for the opportunity. NYCFitFoodFashion is disclosing this in accordance with the Federal Trade Commissions 16 CFR, Part 255 Guides Concerning the Use of Endorsements and Testimonials in Advertising.